Competition - Win Flowers For Mother's Day! Thank you to everyone who entered our Afternoon Tea voucher competition. 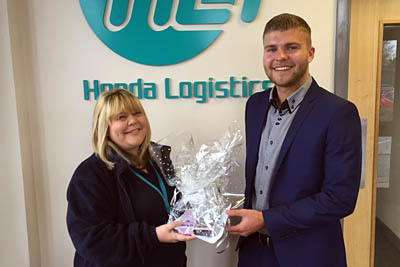 Congratulations to Kerry Cope from Honda Logistics UK Ltd in Swindon (pictured with Fraser). Kerry correctly answered that Janus, the Roman God after whom January is named, possesses TWO faces - one to look backwards at the previous year and one to look forward to the new year. Kerry wins a £30 Afternoon Tea voucher for use at any of the beautiful hotels that form part of the Cotswold Inn and Hotel Group. By what common name is the plant "Lonicera Periclymenum" better known? Email your answer and contact details to jackie@jackiekerrrecruitment.com and the lucky winner will be drawn from the correct answers on Tuesday 28th February 2017 - good luck!